Falcon shows latest cooking technology for schools at LACA Main Event 2017. Stand M25, 5th-7th July 2017, Hilton Birmingham Metropole. On Stand M25 at this year’s LACA Main Event, Falcon will be showing how the latest cooking equipment can make a huge difference to school catering operations in terms of energy efficiency, versatility, space saving and speed. School kitchens need reliable catering equipment that speeds up production time as there is no leeway in dinner serving times. The equipment also needs to maximise the use of the space available and adapt to the school’s varying menus and demands. Falcon’s popular compact combi ovens are ideal for busy school kitchens where space is limited as they are only 510mm wide. 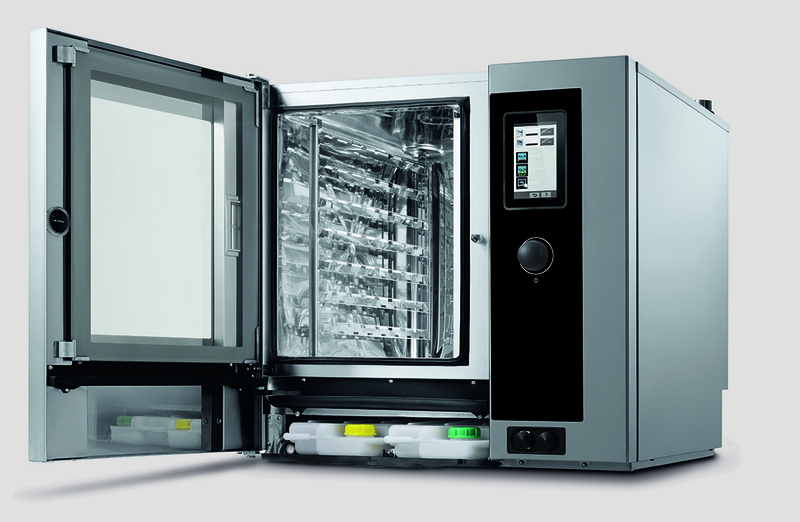 They have the same features and performance that would be found in the standard-sized combis, such as an easy to operate touch screen with 400 programme storage capacity and an automatic cleaning system, but on a smaller footprint. The combis offer school caterers the ability to perform multiple methods of cooking and replace several more specialised pieces of equipment, whilst adding increased capacity. They are extremely energy efficient pieces of kit, too. Induction hobs are also becoming more and more common in school kitchens, winning even the most sceptical of caterers over. Induction cooking is more energy efficient than gas or electric hobs and, as over 90% of the energy generated is directed straight into the pan, induction hobs heat-up extremely quickly with very little heat escaping into the overall kitchen environment. The most energy efficient oven range available to schools is an induction hob with a fan-assisted oven, such as Falcon’s Dominator Plus E3914i four-zone induction range. The E3914i induction range delivers on speed of cooking and energy efficiency, with four 5kW heat zones, which are precisely and instantly controllable. The hob is constructed from 6mm toughened glass and has undergone rigorous testing, including a drop-test that is more thorough than the BS EN standards demand. Falcon manufactures cooking appliances that are big on quality, reliability and value for money… perfect for the demands of busy school kitchens. Falcon’s comprehensive product range is backed by award-winning sales, technical and culinary support. Representatives from Falcon will be on hand on stand M25 to answer any questions, help school caterers choose the right equipment and explain how to get the best from it.